Clear the blocks in the upper part of the screen, in order to make it to move on. 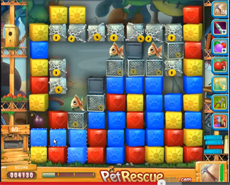 DON’T clear the blocks immediately under the wired locked blocks, because then the pets will be captured there and you will not be able to rescue them. When the screen will move on, then clear some blocks in order to create an opening in the wired locked blocks and then smash the wires of them. Keep at least one bomb and make it reach the bottom of the level, because you’ll need it there to destroy the two metal boxes that prevent pets’ rescuing. The video tutorial below will help you to beat Level 515!